Express’s Orca class RoRo vessels, in 2016.
addition to other LNG-powered vessels. 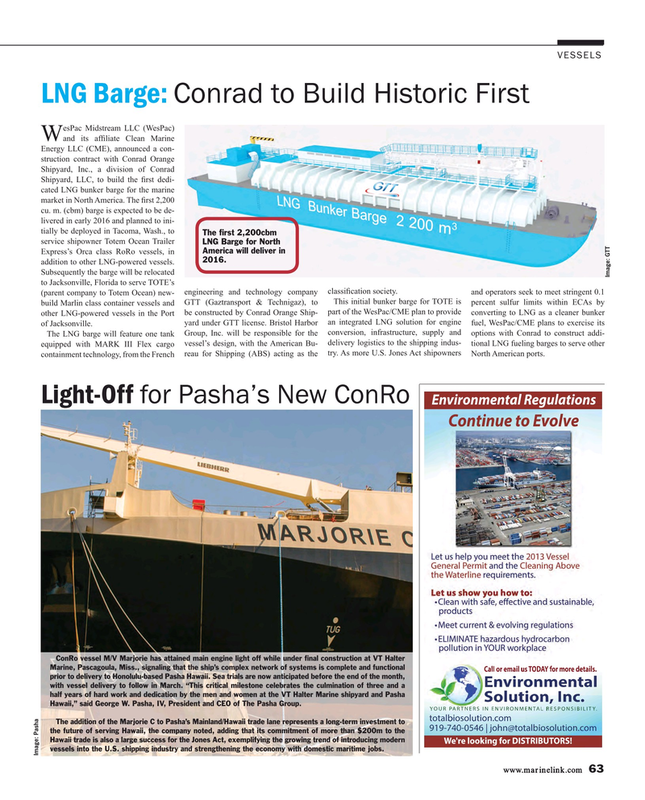 The LNG barge will feature one tank Group, Inc. will be responsible for the conversion, infrastructure, supply and options with Conrad to construct addi- equipped with MARK III Flex cargo vessel’s design, with the American Bu- delivery logistics to the shipping indus- tional LNG fueling barges to serve other containment technology, from the French reau for Shipping (ABS) acting as the try. As more U.S. Jones Act shipowners North American ports. Hawaii,” said George W. Pasha, IV, President and CEO of The Pasha Group. Hawaii trade is also a large success for the Jones Act, exemplifying the growing trend of introducing modern vessels into the U.S. shipping industry and strengthening the economy with domestic maritime jobs.